As eyes start turning to North Korea after their latest Missile launch and weather watchers are tracking Hurricane Irma barreling across the Atlantic, watching and waiting to see if it is going to cause devastation to the east coast, the victims of Hurricane Harvey are still trying to clean up the mess and disaster left by Hurricane Harvey. 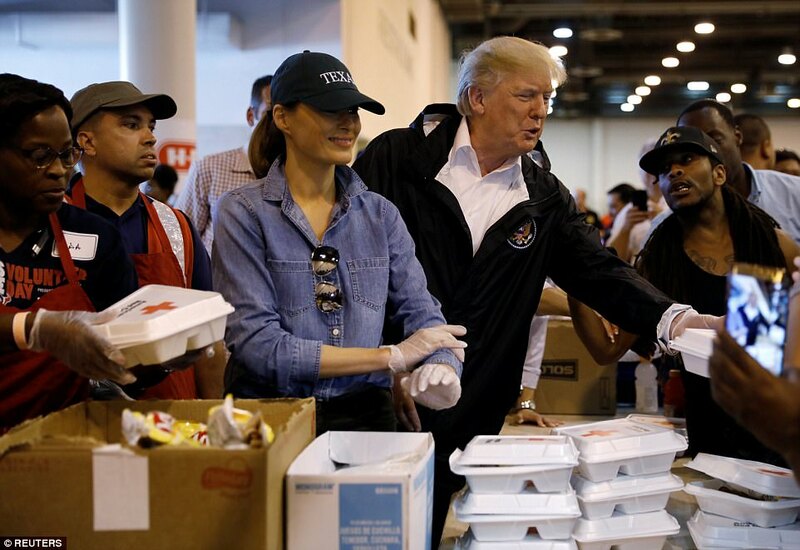 As President Trump and First Lady Melania make multiple trips to Texas, first to gauge the extent of the damage to provide relief funds, and then to interact with the victims, the media and the far liberal left is still busy trying to divide the nation, at a time when everyone should be united in prayer for the victims, as they cast hatred and vitriol, not only towards the President and his wife, but at Texans themselves. There are tens of thousands of Texans in evacuation shelters across Texas, with over 100,000 homes destroyed leaving even more homeless. 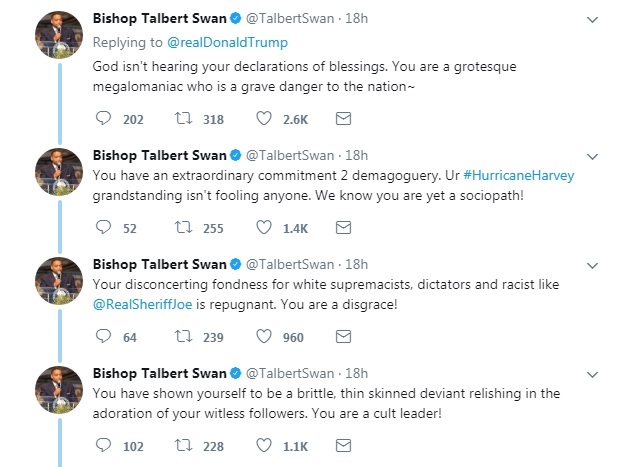 At least 44 people are dead from Hurricane Harvey and the aftermath flooding, with more expected to be found as the clean up continues, yet certain members of the mainstream media can only use these victims and this catastrophe to attack President Trump, even as officials in Texas as well as pastors, and the people directly affected are praising him, his response, his visits and the federal governments efforts to hep. For example, in the minute-and-a-half video clip below, where MSNBC reporter Garrett Haake, talks to the Morning Joe panel about how President Trump received a "hero's welcome" from the people in Texas, Mika Brzezinski can be heard cutting in to her co-hosts statement to claim that it is foreign for President Trump to "be human," or to be "empathetic." 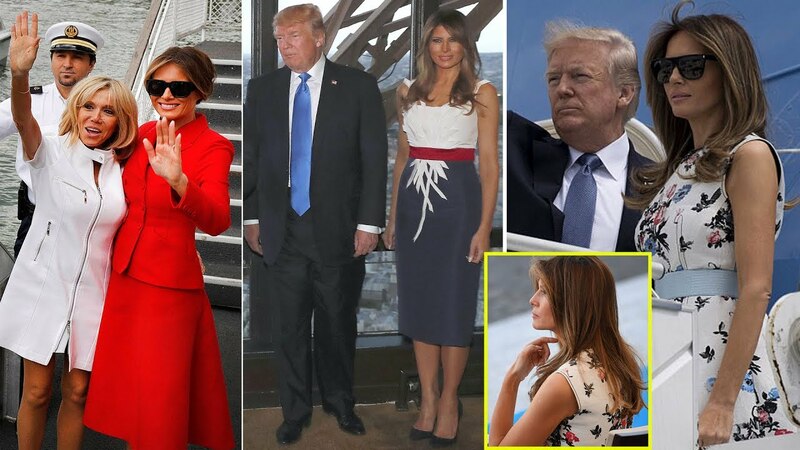 The hatred and vitriol started with the president and First Lady's first trip, which was reportedly to "assess the damage," speaking to officials on the ground, etc, yet the media immediately started attacking. One of the pettiest attacks came against Melania Trump for wearing high heels when leaving Washington to head to Texas. 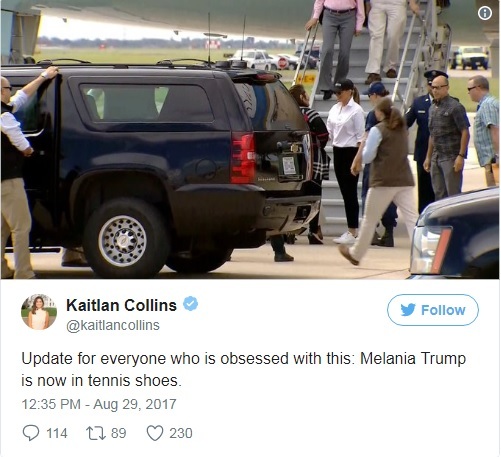 Politico, The New York Times, The Washington Post and Vanity Fair, all "went there," criticizing, mocking and otherwise spewing the hate-filled vitriol against the First Lady, but....Oooops, seems Melania changed on the plane into another outfit and sneakers, yet no apologies from the "how low can you go crowd," nope, just on to accuse president Trump of not being "human" or emphatic," enough on a trip that was meant to assess damage, not interact with the populace. 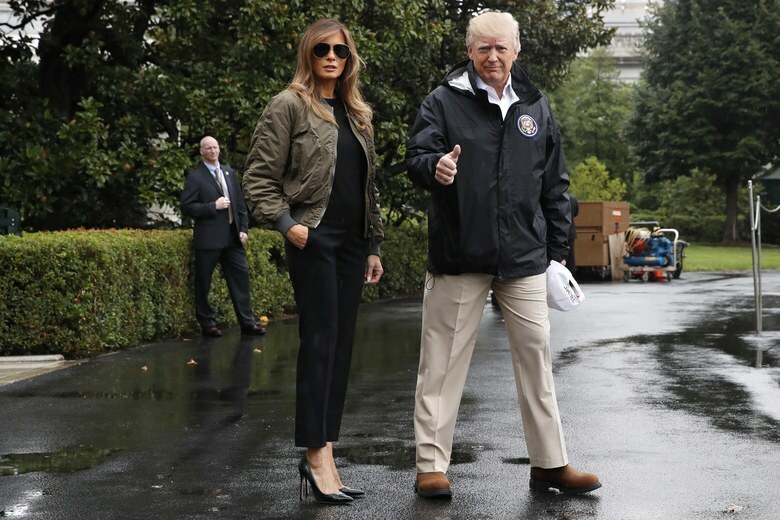 Perhaps one of the most disturbing attacks against Melania came from Vogue writer Lynn Yaeger, who titled her piece "Melania Trump’s Hurricane Stilettos, and the White House’s Continual Failure to Understand Optics," as she writes "A spokesperson says she has other shoes to change into on the plane—and one sincerely hopes there is a pair of leopard-print Wellies-in-waiting to get her from the tarmac to the limo. 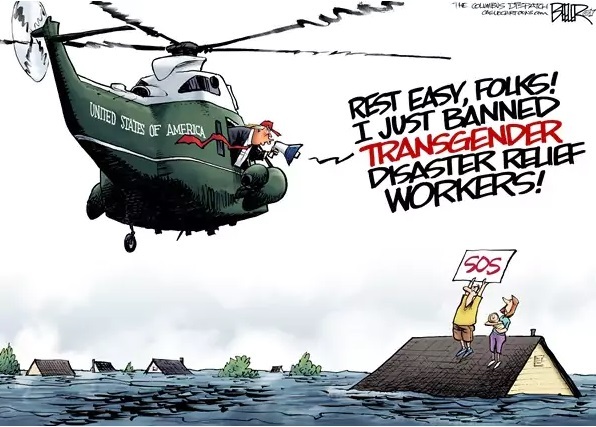 But what kind of message does a fly-in visit from a First Lady in sky-high stilettos send to those suffering the enormous hardship, the devastation of this natural disaster? And why, oh why, can’t this administration get anything, even a pair of shoes, right?" Now, let me make a point before moving on to even more vile hatred and vitriol being thrown at Texas, and the President. The woman who wrote the drivel about Melania and the "optics" of how a person dresses, is the contributing fashion editor to Vogue and the former fashion reporter for The Village Voice. 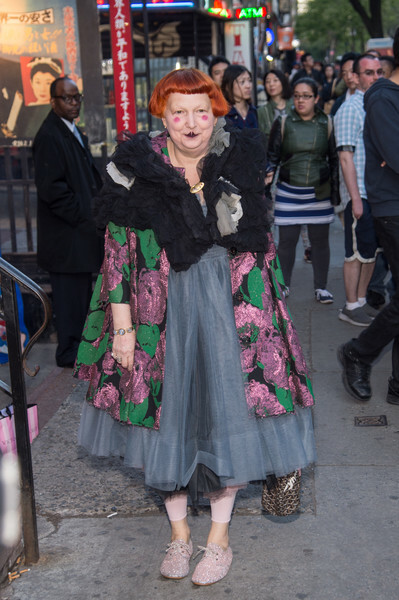 Is supposed to take fashion advice from this woman? 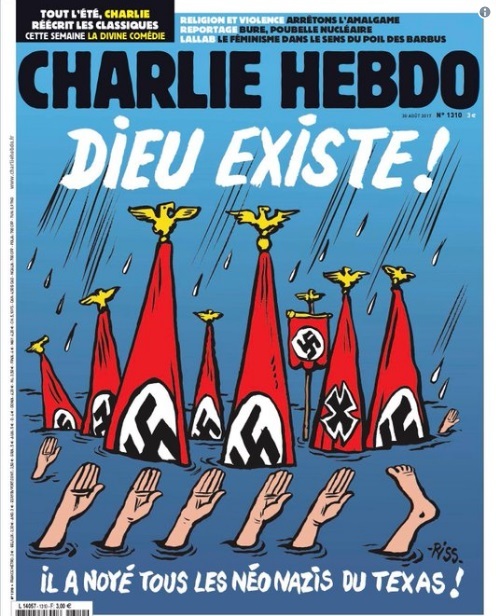 One last example is Charlie Hebdo, an outlet that received tremendous support from Americans after a devastating terror attack in January 2015, when two brothers, Saïd and Chérif Kouachi, forced their way into the Charlie Hebdo offices, armed with rifles and other weapons and killed 12 people and injured 11 others. Americans stood in unity with them. How does the satirical paper repay that spirit of unity in regards to the devastation of Hurricane Harvey hitting Texas. Yup, no shortage of vitriol on the part of the media and the cartoonists across the world. The President and the First Lady went back to Texas, to visit with the victims of Hurricane Harvey, they passed out food and hugged, kissed and played with children at the "kid zone" in Houston's NRG Center, then visited a church in nearby Pearland, where they helped load half a dozen cars with boxes of supplies for victims, described by Reuters as taking up the mantle of "comforter-in-chief." The Daily Mail has some wonderful images of the President and Melania interacting with the Hurricane victims, handing out food, hugging and kissing children, letting folks take pictures with them, shaking hands, and generally just lifting the morale as I saw one pastor say earlier this morning on the news. Earlier reports show that the President was also donating a million dollars of his own money to the relief efforts in Texas. It was a good visit by almost all accounts, the images meant to show unity, and the fact that no matter what is happening in the world, the victims of hurricane Harvey are not being forgotten. 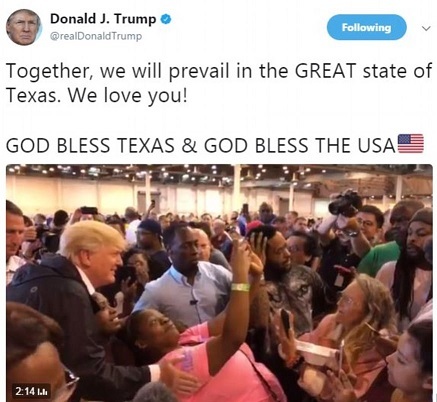 The President tweeted an awesome video with clips of his visit, and in the back ground the song and lyrics of 'Proud to be an American,' with the message "Together, we will prevail in the GREAT state of Texas. We love you! GOD BLESS TEXAS & GOD BLESS THE USA." Message of unity, the song chosen with care, as watching the people of Texas work together, seeing the rescue efforts over this past week showing that in a time of disaster, cities, states, and the country can come together to offer help, support and prayers for those suffering, all enough to make everyone be proud to be an American, but what do we see on social media to that tweet? 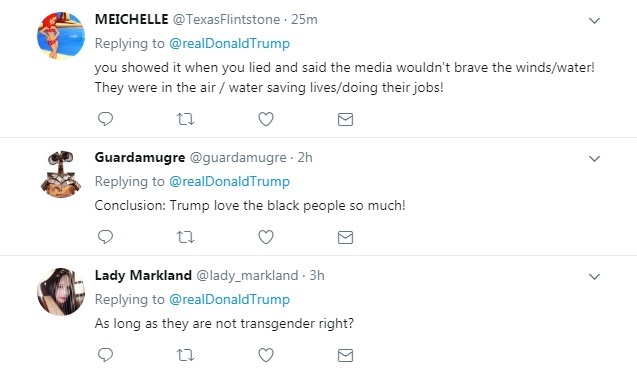 There are also quite supportive responses to Trump's video montage and blessings for Texas and the U.S.. See comments here. 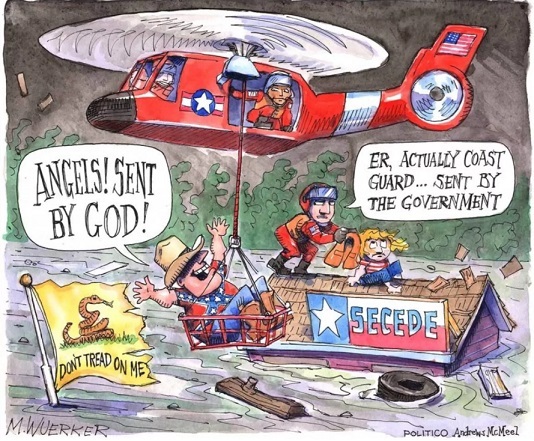 The mainstream media also showed an inability to help unite the country in a time of disaster, as CNN offended a victim who told them exactly what she thought of them when she said, live on air "But y’all sit here, y’all trying to interview people during their worst times – like that’s not the smartest thing to do." Rush Limbaugh provides other examples of the media attacking Trump in regards to his visits to Texas: (Notice how they all highlighted the word "empathy," almost like it was the talking point of the day and they all colluded. Another example of hatred towards Texas in a time of catastrophe is the story of a college professor who has now been fired for asserting that Hurricane Harvey was "karma" for Texas for their support for the GOP. 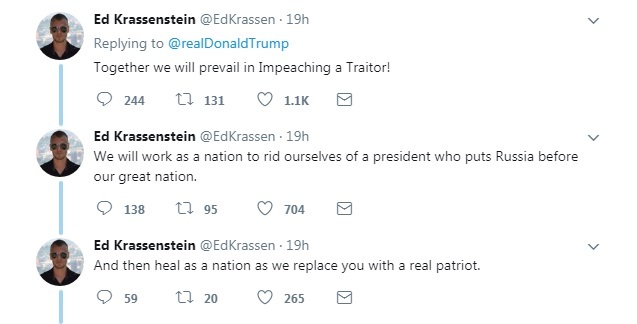 All of that is just the tip of the iceberg, there are literally too many examples from the media, social media users and liberal bloggers, to detail them all in just one article. They say disaster brings out the best and the worst in people and we have seen this axiom proven true as stories of price gauging and looting started immediately following Harvey, just as we saw the best in the rescue images that have gone viral, the people working together to help others, share what they have with those that had nothing left, but at a time when we see ANP readers praying day after day for the great people of Texas, without caveats on politics, religion, or sexual orientation, just prayers for the safety of everybody, to see the media, the cartoonists, the hate-filled liberals incapable of empathy and sympathy and only capable of continued spewage of vitriol, is truly heartbreaking. 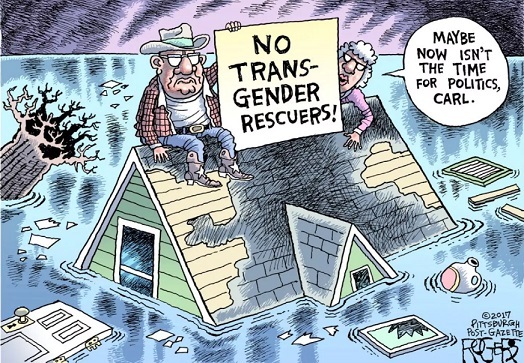 No matter the politics, no matter any other issue, the President has been hands on, with Texas state officials saying he has been engaed, compassionate and unifying, is it too much to ask that at least in regards to Texas hurricane relief efforts and Trump's attempt to unify a nation to get behind Texas, that liberals in and out of the media, take a break from pushing hate and division? Sadly, the answer seems to be yes, it is too much to ask.